Cotton Parade Gloves Dozen Pairs. 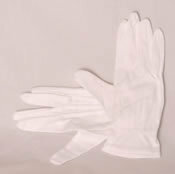 Heavyweight white cotton parade glove. 100% cotton. Piping trim on back. Individually bagged per pair. Made in China. The perfect style of gloves for upscale events and special occasions such as funerals, military parades, fine dining restaurants, etc, as well as for handling jewelry and silver in finer retail establishments. This glove is great for Catering, Marching bands, Santa, Parades, Inspection, Magicians,Tuxedo Formals,Costume, Military, Doorman, Fire or Police Dress Uniforms.